Our Shade & Heat Retention Curtain Systems are designed to maximize your greenhouse growing conditions. We feature both a cable driven and a rack and pinion driven system. StrataScreen™ is the ultimate in suspended cable driven curtain systems, utilizing proven stainless steel suspension lines and a stainless steel aircraft cable drive system. CirraScreen™ is the ultimate in suspended push-pull driven curtain systems, utilizing stainless steel suspension lines and a steel rack and pinion drive system. A wide variety of fabrics are available in order to assure you the correct shade and energy retention curtain system to outfit your greenhouse growing operation. 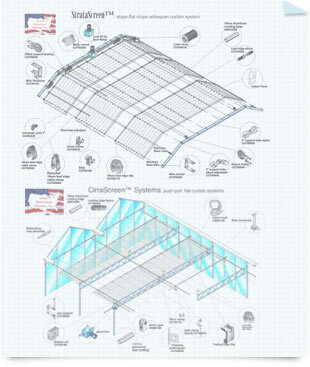 Click the drawings below for further details about the StrataScreen™ and CirraScreen™ Curtain Systems available from United Greenhouse Systems. Flat Curtain System available from United Greenhouse Systems. Slope-Flat-Slope Curtain System available from United Greenhouse Systems. Sloped Curtain System available from United Greenhouse Systems.